If you hurt yourself, what would you shout out in your language? In English it's ouch! or ow! At least, those are the polite things we shout! Learn more about English interjections in this session. Do you know your ouch! from your ugh!? How about yippee! and hooray!? These words are called interjections and to find out more listen to Callum and Catherine in this episode of 6 Minute vocabulary. And me Catherine. In this programme we’re talking about interjections. Interjections are words that we use to express an emotion or feeling. For example Oh! expresses surprise and Hooray! expresses pleasure when something good happens. We’ll give you plenty of other examples. We’ll have a quiz; and we’ll finish with a top tip for learning vocabulary. Here are Peter and Kylie. They’re at home in their kitchen. And while you listen, think about this question: What emotion does Peter express by the word Phew! at the end of this conversation? 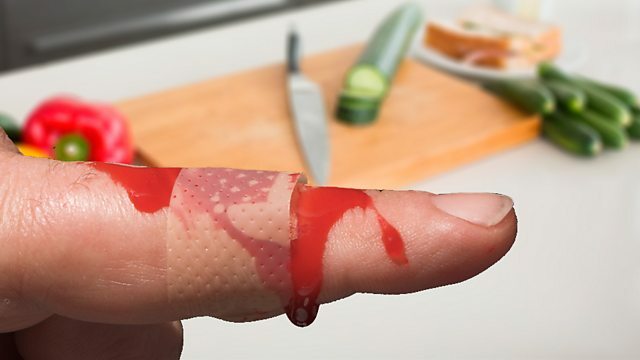 Peter: I’ve just cut my finger. Kylie: Oh! Quick, where’s the First Aid kit? Peter: It’s in that drawer. Kylie: Got it. Ugh! There’s blood everywhere. Oh no! It’s on my T-shirt now. Let me see your finger. Kylie: There, got the plaster on it, hooray! So that was Peter and Kylie. And we asked: What emotion does Peter express by the word Phew! at the end of the conversation? And the answer is that he expresses relief. Peter feels relieved that Kylie has got the plaster on his finger. He does. People use interjections a lot in everyday speech. It’s interesting that one little word like Phew! can express so much, isn’t it? It is. And that’s why it’s important to learn to use interjections when your speaking, to make your English sound more natural and fluent. Now, interjections usually come at the beginning of what we are saying, but they can sometimes come at the end. So Peter says Phew! Thanks, but he could have said Thanks. Phew! But, whichever way he says it, the interjection stands alone. There are no words to connect it to what comes after or before it. That’s right, and if you’re writing a conversation with interjections, they’re usually followed by an exclamation mark. Because the exclamation mark emphasises the strength of the emotion and increases the interest for the reader. Phew! with an exclamation mark looks more dramatic than Phew. with a full stop. It does. That’s interesting, isn’t it? Let’s have our first clip. Right. So what does Peter express with Ow! Ow! expresses sudden pain. We can say Ouch! too. They mean the same. And the second interjection was Oh! Kylie uses it to show surprise and alarm that Peter has cut his finger. Yes. Now if you wanted to describe the scene in writing you would have to say: Peter shouted in sudden pain, instead of using Ow! Or Peter’s voice expressed relief, instead of using Phew! That’s right. Interjections are very useful when speaking, but they’re not often used in written English, except for writing dialogues like the one between Peter and Kylie. OK. Let’s have our second clip. Kylie: Ugh! There’s blood everywhere. Oh no! It’s on my T-shirt now. Let me see your finger. OK. Kylie uses three interjections there! No we don’t usually use so many together but the situation is quite dramatic, so it’s natural to use them together there. There was Ugh!, which expresses disgust at the blood everywhere. And there was Oh no! which expresses shock. Kylie was a bit shocked that the blood was on her T-shirt. And finally Hooray! That expresses pleasure or delight that something good has happened. Kylie was very pleased that she’d managed to get the plaster on Peter’s finger. Other common interjections are Wow! for admiration, Oops! for when you make a mistake and Yippee! for excitement. It’s time now for our quiz! Listen to each sentence, then choose the correct interjection to go before each one. Number one: There’s a dead snake in the road. Is it a) Ouch! Or b) Ugh! It is! Number two: What a beautiful building. Is it a) Wow! Or b) Hooray! It’s a) Wow! for admiration. Correct! Number three: Amy’s passed her driving test. Is it a) Oops! Or b) Phew! Excellent! That’s the end of the quiz and congratulations if you got them all right. Before we go, here’s today’s top tip. When you’re speaking everyday English, you don’t always need to use high-level vocabulary to express your meaning. It’s more important to be clear and sometimes simple words like interjections express your meaning much more clearly than a sentence with advanced vocabulary in it. You can download 6 Minute Vocabulary from our Unit 22 Downloads page. Remember, you can also subscribe to the podcast version. They are used a lot in everyday speech. They are not often used in written English except in written conversations. They usually come at the beginning of what we’re saying and they are often followed by an exclamation mark. The exclamation mark increases the strength of the emotion.